Greetings! To the brethren of the International Assemblies of the FirstBorn, in the grace and the love of the Lord Jesus Christ! I want to appreciate and thank the congregation of Calvary Lighthouse Mission for hosting this year’s ministerial conference. Your hospitality and love left an indelible impression on the hearts of all those who attended. Those who were privileged to attend experienced a totally different agenda than what they may have anticipated. We were so blessed to have Dr. Rachel Sugimoto from New Hope Bible College instruct us on Transformational Ministry. We gleaned great insight from her teaching and came away challenged to continue progressing in biblical knowledge and studies. Keynote speaker, Rev. Andrew De La Torre, our General Secretary, inspired us to “Press On” through all things, even that which may try to hinder us. Throughout this event we were reminded to not neglect our gift but use it for God’s glory; and that’s what our Ptr. 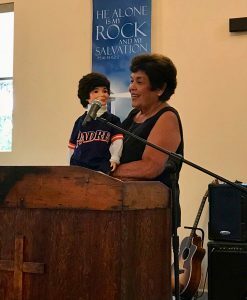 Arliss Freeman, ventriloquist, did as she brought “Jerry” out of retirement and brought joy and laughter to our fellowship! Thank you to the event’s committee and all who had a hand, seen and unseen, to make this conference a success. And to the One who sits on the throne, who gives us the opportunity to “get to do ministry”, we give You all the thanks, and praise and glory!